Evidently beguiled by seeing their stories in the pages of the New York Times, two high-profile journalism start-ups failed at building sufficient audience for their own brands. Now, one of the two philanthropically backed ventures is folding and the other is seeking to merge with a neighboring non-profit that was wise enough over the years to cultivate multiple audiences and diversified financial support to sustain its important journalistic work. The start-up about to close is the Chicago News Cooperative, which will leave a staff of 30 jobless after it sends its final stories to the New York Times later this week. Meantime, the Bay Citizen in the San Francisco is pursuing a merger with the 35-year-old Center for Investigative Reporting (CIR), which pioneered non-profit investigative journalism well ahead of such prominent brands as Pro Publica, the Texas Tribune and, well, the Chicago Cooperative and the Bay Citizen. The Bay Citizen says its contributions to the NYT will continue for the time being. The Chicago Cooperative and Bay Citizen are notable not only for launching with hefty endowments from local benefactors but also because they were selected at inception by the New York Times to provide two pages of local coverage in their respective markets on Friday and Sunday of each week. Though both start-ups were sworn to secrecy by the NYT, sources confirmed that they received only token financial support from the newspaper, which sold and kept the proceeds from any ads appearing on the local pages. The financial situation is more positive at the Bay Citizen, which entered 2012 with some $7 million of its initial $17.5 million nest egg intact, according to its financial statements. But things have not being going smoothly. In addition to the death in December of its principal benefactor – a local businessman who gave $6 million to jump start the project in 2009 – the Bay Citizen has suffered the sudden exodus of nearly all of its top leadership, including a chief executive who was paid $456,918 for her work in 2010. The merger with CIR is aimed at saving nearly $2 million in operating costs and increasing the impact of the reporting by both organizations, according to the Bay Citizen website. CIR, which is based in Berkeley, CA, enjoyed none of the advantages of the Bay Citizen when it was bootstrapped from nothing in 1977 by journalists Lowell Bergman, Dan Noyes and David Weir. Under the leadership today of executive director Robert Rosenthal, CIR is a well-regarded contributor to 60 Minutes, Front Line, the Washington Post, the Los Angeles Times and other California and national media. Its work is supported not only by institutional and individual philanthropic donations but also by contributions and fees from its array of media partners. In the last two weeks alone, CIR won a $1 million grant from the MacArthur Foundation (yes, the same outfit that stopped funding the Chicago Cooperative) and a Polk Award for a yearlong investigation exposing bogus Medicare billing at California hospitals. According to Compete.Com, the Chicago venture had just 10,121 unique visitors to its website in January, representing 0.1% of the population of the metropolitan area. The Bay Citizen attracted 41,626 uniques, or 0.6% of the eyeballs in its market. By comparison, the website of MinnPost.Com, which commenced operations with $850,000 and never enjoyed the visibility of four pages a week in the NYT, reaches 1.8% of the population in Minneapolis-St. Paul. 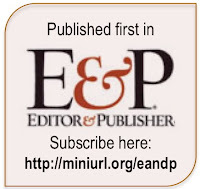 While MinnPost’s audience falls well short of the market penetration of the well-established print and broadcast media serving the Twin Cities, the non-profit venture has made a major effort to diversify its support among corporate and individual donors. Only 21% of MinnPost’s support in 2011 came from foundations, with the balance of funding coming from individual donations, corporate sponsorships and even an annual gala featuring organic vodka martinis provided by a local producer. By contrast, the Bay Citizen relied on major philanthropic gifts for 92% of its backing in 201o, according to its annual report. And the situation was no better in Chicago, according to an inside source who was not authorized to speak publicly on behalf of the cooperative. What went wrong at these two well-intentioned efforts? In retrospect, it seems clear that both projects were so well funded and so gratified by the presence of their work in the NYT that they did not do nearly enough to establish the independent visibility and financial viability of their nascent brands. Yet, each of them seems to have stumbled in a different way. The Chicago Cooperative concentrated all but one of its hires on journalists, including several prominent and well-compensated individuals who devoted most of their efforts to putting the best possible work into the NYT. While readers may have appreciated the articles in the newspaper, scant attention appears to have been paid to converting them into individual or corporate supporters of the venture itself. The Bay Citizen, on the other hand, invested heavily on development. Its tax return shows that it spent $648,225, or 17.9% of its total operating budget, on management and fund-raising in 2010. While this may have yielded some big-ticket donors who otherwise might not have materialized, the Bay Citizen to date reports that it has recruited only 8,500 individual donors, or a mere 0.12% of the more than 7.2 million people living in the Bay Area. That’s hardly the broad support a non-profit needs to sustain itself in the absence of continuing philanthropic largess. And our friends in Chicago can tell you what happens when institutional funding dries up. The use of email has plunged by more than 30% in the last year among consumers under the age of 24, owing to the increased use of texting and Facebook to stay in touch. That’s one of the eye-opening paradigm shifts identified in a must-read report from comScore on the fast-changing state of the digital universe. 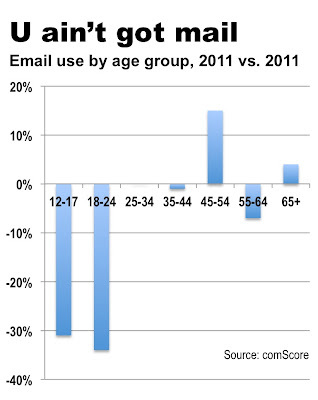 A primary activity among wired individuals since the arrival of the Internet, email use in the last 12 months fell by more than 30% for those under the age of 24 and stayed absolutely flat among those aged 24-44, according to the audience measuring service. 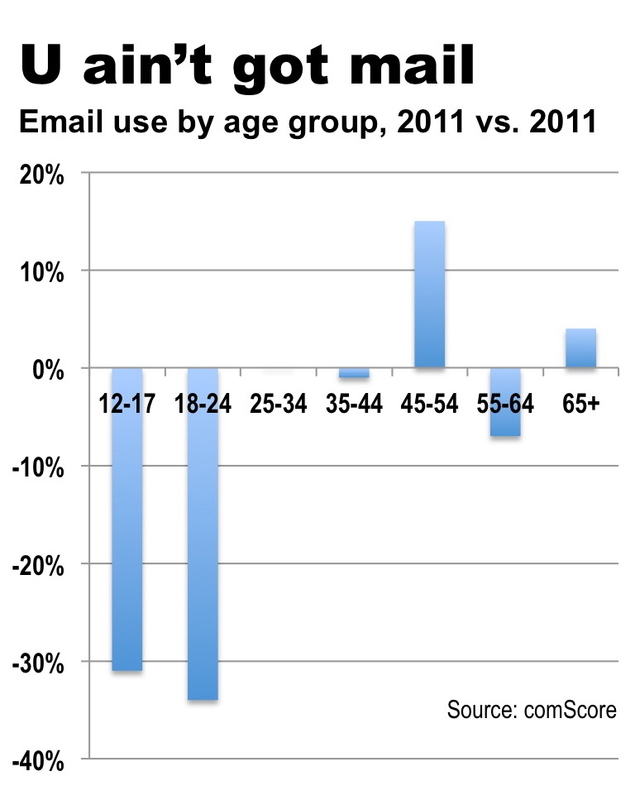 As illustrated below, only those aged 45-54 are pecking out more emails today than they were a year ago. The reason, of course, is that a growing number of people are communicating via Facebook and/or text messages on their mobile phones. Many, of course, also are chatting on the Facebook apps on their smart phones. The rapid shift in one-on-one communication is not the only disruptive trend noted in the comScore study. Putting its growing traffic to good use, Facebook last year became the top publisher of digital display advertising. Facebook ran more than 1.3 trillion ad impressions, as compared with 529 billion at Yahoo, 215 billion at Microsoft and 174 billion at Google. Two years after the debut of the iPad, most newspaper publishers still are fretting and fumbling over what to do about it. Even though the iPad 2 was one of most popular items at Christmas and the third-generation version of the product is likely to turn up well before Santa returns this year, many newspapers have yet to develop their very first app. Of the publishers who took the plunge, most were so unclear on the concept that they shouldn't have bothered. But publishers have to start doing better, because iPad owners, who represent the vast bulk of the tablet computing market, look an awful lot like newspaper readers. In a study released last year, the Pew Research Center’s Project for Excellence in Journalism found that 90% of tablet owners – who are concentrated among wealthy, highly educated grownups between the ages of 30 and 49 – regularly use the gizmos to consume news. Significantly, 59% of the respondents said the tablet has taken the place of “what they used to get” from a print newspaper. In other words, tablet users represent not just a potentially valuable audience for publishers but also one they can’t afford to lose. 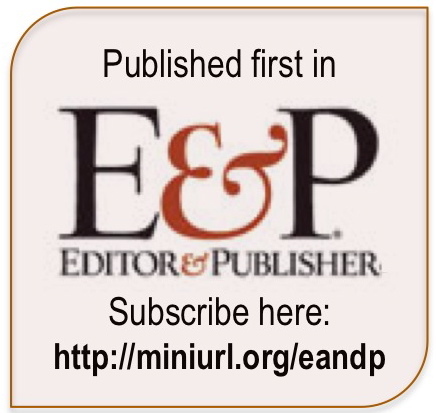 Notwithstanding the stakes, publishers have been anything but nimble in addressing the best medium yet for transitioning the traditional print experience to a truly compelling, lean-back digital platform. Because newspapers seldom invest in creating bespoke digital content for their apps, their iPad offerings pale in comparison to those produced by any number of competing magazines, broadcasters and native digital publishers, including – to name but a few – Bloomberg BusinessWeek, France24, BBC and News Corp.’s The Daily, which, though journalistically anemic, is pointed in the right direction. All of these apps, like the most of the 140,000 others available at the Apple store, feature interactive tools, rich graphics, audio, video, maps and much more. That is to say: They fully leverage the power of this new medium. Newspapers, on the other hand, largely have punted, letting readers use the incumbent Safari web browser on the iPad to plumb the dense, user-unfriendly websites where publishers dump their print output for consumption on the web. In contrast to the crisp, graphically engaging and highly interactive apps flooding the Apple store, the typical newspaper site is filled with gray, meandering columns of text requiring multiple swipes to get to the bottom of the page. That is to say: Newspapers don’t come close to leveraging the power of this new medium. The few newspaper publishers who ventured into app development tripped themselves up. While the New York Times is one of the few publishers successfully charging for access to its digital content, its text-centric iPad app offers only a limited sample of the material available in print. The sparseness of the news report combined with the paucity of interactive content make for a distinctly tepid experience. In Silicon Valley of all places, The San Francisco Chronicle concocted a paid app that includes a smattering of up-to-date news and sports but relies heavily on such archival material as old – and I do mean old – columns from the late, great Herb Caen, who died in 1997, pounding his Loyal Royal typewriter to the end. How could the paper be more out of touch? In perhaps the saddest iPad project of all, the Philadelphia Inquirer produced an app consisting of a clunky, slow-to-load, scarcely interactive PDF of its broadsheet. Then, hoping to build a base of dedicated users for this less-than-scintillating experience, the publisher slapped the app on 5,000 tablets manufactured by some no-name company in France. At last report, a fair number of those no-name tablets were gathering dust in some warehouse. There is one bright spot: It's The Peel app launched by the Orange Country Register, which is updated in the early evening each day at the time when iPad use is known to peak. Built from inception as a dedicated app, the easy-to-navigate Peel includes not just the latest news, traffic, weather and sports but also splashy pictures, interesting video and other elements that make it visually appealing, quick to read and fun. The key to successful iPad development is not to reprise the newspaper but to leverage the platform to create new experiences for audiences you are trying to attract, be they football fans, barbeque aficionados or architecture buffs. Beyond selling advertising, a successful app can get consumers to subscribe to unique, premium content. Although Pew discovered that four out of five people won’t buy news on the iPad, Zynga’s $7 billion IPO valuation proves consumers will spend money on something they care about. Tapping into consumer passions is the way to win in AppVille.